Back Tree Service, Cincinnati | Relax… Get Back! 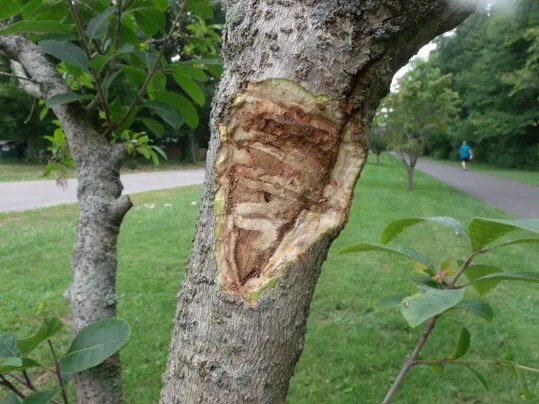 Emerald Ash Borer now attacks other tree species! Emerald ash borer has been found in white fringetree, Chionanthus virginicus, in the Dayton and Springfield areas of western Ohio. Part of a dead adult found in one of the trees has been positively identified by USDA personnel along with larvae from the same tree whose anatomical characters are consistent with emerald ash borer. Live larvae were found in single trees in each of four sites. Many more dead larvae were found in the trees. It was estimated that emerald ash borers had been in the trees for at least four years. The meeting in Lake Tahoe was by invitation only, and it was an honor to be considered worthy of this invitation. 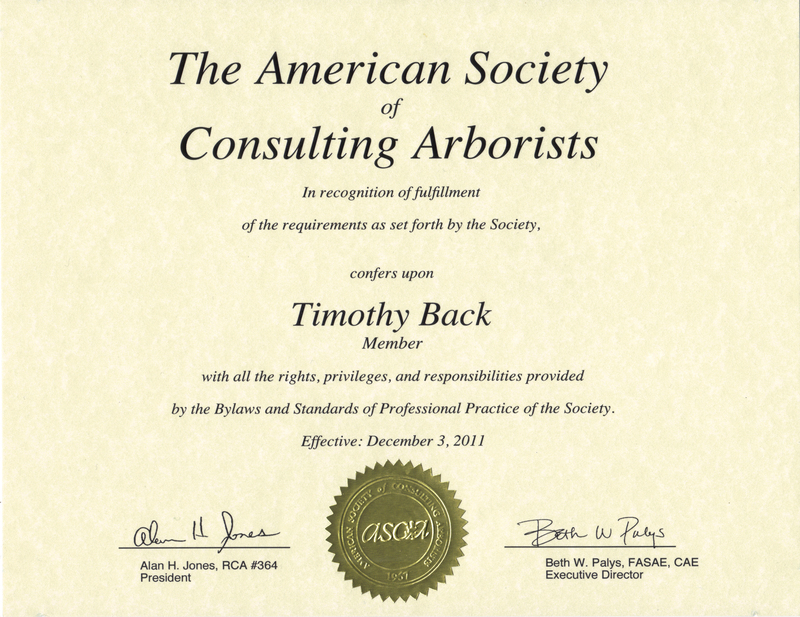 I talked with several other professionals, Certified Arborists whom I respect, and was humbled to find that they had not yet met the requirements of ASCA. And that made attendance very special to me because of the respect that I have for these colleagues talent, and professional skills. Once again. it was humbling just to be able to attend. The outcome has been that admitted into ASCA as a member and was awarded the following certificate. 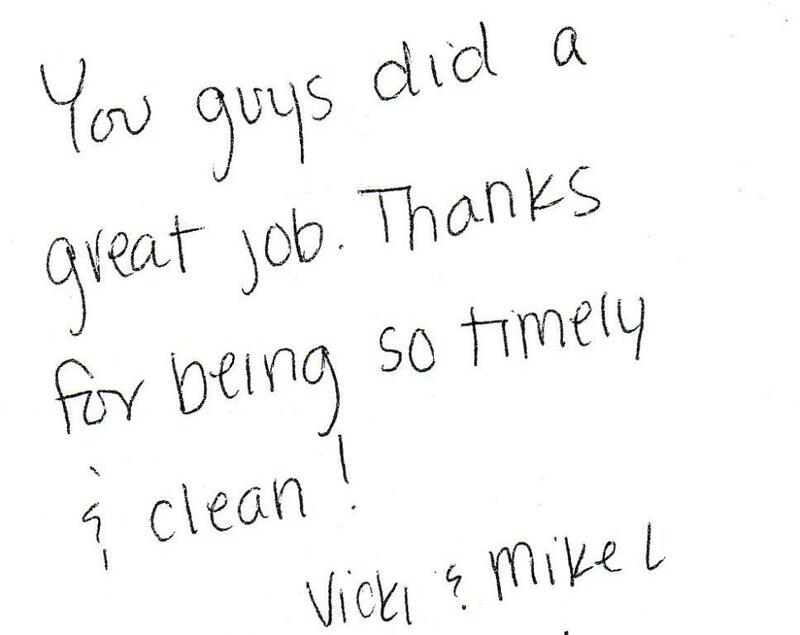 A letter from a customer in Greenhills who is very happy with our vertical mulch and fertilizing program. Click on the pictures to enlarge and see what Pneumatic Vertical Mulching and Fertilizing has done for Wendell’s arbor vitae’s. We recently received this comment from Sarah about our treating her Ash trees for Emerald Ash Borer. Thanks Sarah. We are glad to be of service. The Back Tree team has been working on the Global Tree Project for weeks. The exhibition will start tonight, September 10th. Here is a press release on the project that you might find interesting. Cincinnati, OH—Friday, August 27, installation begins for Hanging Garden, the most recent site-specific installation from the Global Tree Project, an international art initiative that seeks to open and affirm connections between audiences and the natural world, in the abandoned deconsecrated19th century Holy Cross Church, in Mount Adams. Focused on nature and the environment, Shinji Turner-Yamamoto creates site-specific installations in venues throughout the world that explore the interplay between absence and presence and illuminate the spiritual in nature. HANGING GARDEN, and all Global Tree Projects completed over the last ten years in India, Ireland, Japan, Washington, DC, Finland, Mongolia, and now, Cincinnati, make visible connections and similarities between plant life and humanity, and emphasize the interconnectedness of all life. What: A thirty-foot installation featuring a live tree supported by a large inverted dead tree. The trees’ intertwined root systems create a suspended garden oriented as a tower or cross at the center of the church. THE ARTIST: Shinji Turner-Yamamoto studied at Kyoto City University of Arts and Accademia di Belle Arti di Bologna and has exhibited widely throughout Europe and Japan, and. His prizes include the UNESCO-ASCHBERG Bursaries for Artists, and Pépinières Européennes pour Jeunes Artistes, and 2000 first prize from the international Targetti Light Art Collection. Past exhibitions include Kyoto Art Walk (Kyoto, Japan – a 2005 international invitational he curated featuring eight installations in city landmarks by ten artists), Crawford Municipal Art Gallery (Cork, Ireland), Museo d’Arte Contemporanea Villa Croce (Genoa), MUAR (Moscow), Chelsea Art Museum (New York), and Ippaku-tei Teahouse, Embassy of Japan (Washington, DC). Back Tree Service, BIO-PLEX, Cassinelli’s Glendale Nursery, Cincinnati Center City Development Corporation, Cincinnati Park Board, Essencha Tea House & Fine Teas, HGC Construction, Inc., Rainbow Treecare Scientific Advancements, Structural Systems Repair Group, THP Limited Inc., Towne Properties, and Rob and MaryAnne Van Praag – Van Praag Productions, Wayne Buildings, Inc.
(Tim Back, Back Tree Service, an ISA-certified arborist and project Arboricultural Advisor, has worked closely with the artist to locate, secure, and uproot the dead tree. In realizing the installation, he resolved critical technical challenges, such as creating a life support system for the live tree. THP Limited, Inc. analyzed the existing structure and defined needed structural reinforcements. HGC construction and Structural Systems Repair Group, a division of HGC, reinforced the church floor to withstand the weight of the trees and designed/installed the scaffolding and pulley system to install the trees. Van Praag Productions is creating a documentary film on the project). Opening reception for Hanging Garden: Friday, September 10, 6 to 8 pm. SPECIAL PROGRAMMING: Sri Lankan Monks from the Ohio Buddhist Vihara chant on Saturday, September 25 from 3:00 to 6:00 pm; Japanese Monks from the Ohio Buddhist Vihara chant on Sunday, September 26 at 12:00, 2:00, and 4:00 pm. Concurrent Exhibition: DISAPPEARANCES, an installation and exhibition at the Contemporary Arts Center (CAC), September 18 – January 30, 2011, features sculptural works and a series of paintings created from church fragments. HANGING GARDEN is supported by the Embassy of Japan in the United States of America, Consulate-General of Japan in Detroit, Japan America Society of Greater Cincinnati, and Ohio Buddhist Vihara. Presenting Sponsor: Toyota Motor Engineering & Manufacturing North America, Inc.
After three years in planning, Tim Back has transitioned Back Tree Service from a tree removal company to saving trees. The auction of tree removal equipment yesterday exceeded expectations, and has positioned Back Tree Service to focus on treating and saving trees rather than removing them. 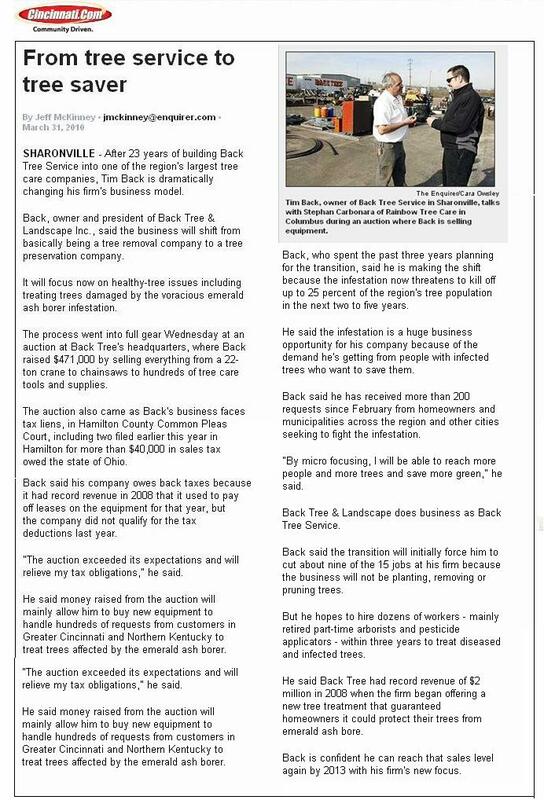 Jeff McKinney of the Cincinnati Enquirer wrote a great article on Tim changing the Back Tree Service business model in order to focus on treating ash trees in the Greater Cincinnati tree service area in order to protect them from the ravages of the Emerald Ash Borer (EAB). You can read the entire article by clicking on the image below. This article covers the auction and the reasons behind it.